The Wheeling Alternative - Am I losing a country? Note -- the labor statistics do show an increase of 4.6% in the mining and logging industry. The Appalachian state is, along with Delaware, just one of two states where poverty rose last year, bucking the national trend of growing incomes and declining hardship, according to U.S. Census data released earlier this month. 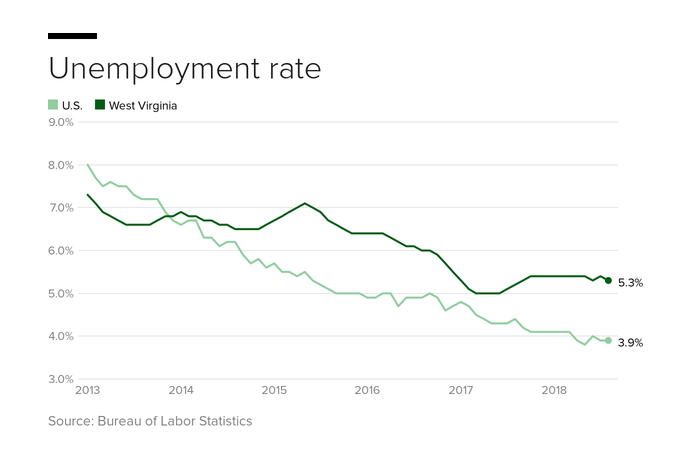 West Virginia's poverty rate climbed to 19.1 percent last year from 17.9 percent, making it just one of four states with a poverty rate above 18 percent. So Trump’s point is false: poverty is not plummeting – it’s getting worse. Switching subjects, Trump followed with an unidentified poll that concluded that West Virginians overwhelmingly supported a vote to confirm Judge Kavanaugh to the U.S. Supreme Court. Trump loved the poll and then attacked what he called “phony polls” (i.e. – polls with what he saw were the wrong conclusions). I checked – this poll was done by the very conservative and obviously biased Judicial Crisis Network. As I’ve noted on numerous occasions, there is usually very little local, non-feature news in the Sunday paper because there is usually only one reporter working on weekends. Not this weekend --three reporters created four long articles and one side-bar for around 3,000 words of mostly pro-Trump coverage. (One article did devote some space to a few of the protesters.) The reporters acted as stenographers (here is what Trump said) or crowd chroniclers (here is what Joe Citizen thought). Everything was taken at face value; nothing was examined. You can read all 3,000 words and nothing will surprise you. I don’t think that the Trump audience was there to learn; rather, it was there to be part-of and connect-with the Trump movement. People don’t attend rallies to educate themselves; they are there to show support and bask in the moment. What about the rest of us who weren't there? For his supporters, Trump's previous “don’t trust the media” rhetoric and the News-Register's uncritical reporting of what he said probably reinforced their support for Trump. For the rest, I doubt that they either watched or spent much time digesting the News-Register's coverage. I can't remember the last time that it has taken me this long to put together a blog post. I watched Trump's Saturday Wheeling speech on Fox and started writing on Sunday. Initially it may have been a writer's block as I just could not seem to get a handle on the subject. I felt as though I had finally pulled it together last night only to read and watch news reports about Trump's rally in Mississippi where he mocked Christine Blasey Ford as some of the crowd laughed and chanted "lock her up." It occurred to me that Trump could just as easily have attacked her on Saturday night in Wheeling. And while I might hope otherwise, I realized that the Wheeling crowd's response may well have been just as ugly as the one in Mississippi. I find that depressing and it occurred to me that similar events in the last two years may be having a cumulative effect. I have lived for the last month . . . with the sense of having suffered a vast and indefinite loss. I did not know at first what ailed me. At last it occurred to me that what I had lost was a country.